A couple of years ago we covered a story about chalk markings being feared to be codes for burglars. 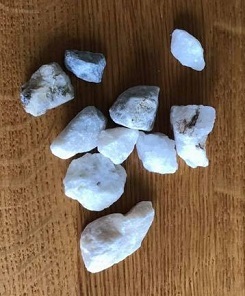 That was largely debunked as utility worker symbols but police in the Somerset area are warning of a potential new method being employed by thieves – white stones. These stones are being left outside homes and under car tyres. The local police believe this may be a way of identifying homes that are unoccupied or of testing when people have left the home (in their car). They are being linked to a man delivering charity collection bags which could be a ruse to checking properties out. While this is not in our local area here in West Yorkshire, and could be nothing, it is still worth being vigilant and if you do notice stones that wouldn’t usually be there or markings of any kind then you should contact your local police force for advice. next Could house sitters prevent burglaries?